The Opening Night Film of Slamdance this year is portrait of the late great Warren Miller who not only changed sports filmmaking but was responsible for the rise in skiing across America. Using the last interview Miller gave before his death last year as the backbone, SKI BUM is the life of Miller from start to finish. Along the way we witness his discovery of skiing as well as his fascination with making ski films- which he schlepped across the country on barnstorming tours every winter. It is filled with interviews with friends, family and admirers who add details and explain how Miller changed the world. For much of SKI BUM the film is like hanging out with a good old friend who is telling you great stories about the good old days. It is great tales about a great guy telling stories about the things he loves. Unfortunately there is a point about half way in where there are sections where things really aren't as interesting as what went before. Some of it seems repetitious and some of the talk about Miller's film business or differences in the way the films are made today isn't as interesting as what had gone before. Its not fatal but it does kind of take a little bit of the sheen off the film. Regardless this film is a must especially if you are a fan of Miller's films or if you've never seen them. 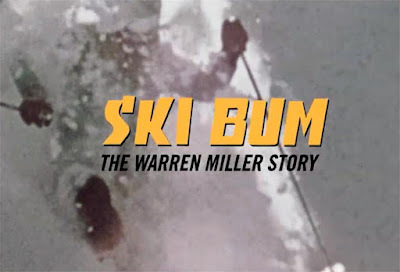 Almost certain to have both a long festival life and long commercial run SKI BUM: THE WARREN MILLER STORY is recommended.